1) "The Money Meltdown and Me", Spread the Fire magazine. 2) Blogger's review of HYFS on "Ask Mr. Credit Card" blog. 3) David quoted in Christian Week newspaper. 4) David cited in "New Horizons" article. 5) HYFS reviewed in local United Church newsletter. 6) How I answer Seth Godin's 8 questions vis HYFS. "The Money Meltdown and Me"
Following the financial meltdown of late 2008, and the continuing controversy surrounding foreclosures, stock market deflation, bank bailouts, executive pay, stimulus budgets, car company credit infusions and so on, it seemed a good time to submit an article for Spread the Fire magazine about the need to keep money in healthy perspective and walk through the wreckage with the Lord. Thanks to the magazine's editor, Melinda Fish, for her input and gentle editing. Is financial stress causing you to lose your perspective? Market implosions, “bankquakes” and their aftershocks can burst a person’s bubble of financial stability and cause you to lose perspective. Financial stress drains a sense of personal worth and is now the number one marriage “buster.” Evidence now suggests that sudden job loss can be harder to recover from than divorce or even the death of a loved one. So how do we keep our footing without being anxious and walk with Jesus through the widespread economic turmoil around us? “Send more money,” otherwise known as the bailout, doesn’t really provide a long term solution. The key for us as believers, as it is in business, is to be healthy about money. So let’s use this occasion to stop and take stock of our rocky personal relationship with money itself. We want it, but we distrust it. We need it and yet resent it. We feel guilty for wanting it but feel better when we have it. We fantasize about being generous but worry that it will corrupt us. We are pleased when it arrives but embarrassed to accept it. We get blessed with money occasionally but sometimes feel that God’s “gracious provision” is just enough and barely in time. In Christian circles it is OK to want to be successful, but not to be wealthy. It’s acceptable, often expected, even preferable, to struggle financially in “the ministry.” Not to worry; otherwise grace-based Christians will make sure of that. It’s spiritual to talk about finances, gifts, support and buh-lessings ---as long as we don’t call it “money.” So we treat it like a necessary evil. No wonder we get stressed about it and little wonder that money seems to avoid us! Christians need to be healthy in their relationship with money in order to handle it with integrity. If you struggle financially, it is often because you were taught that you are supposed to struggle. The healing of the heart is one of the core values of this renewal. Let’s extend the message to the area of financial struggle. Have financial judgments of others closed your life to the possibility of blessing? Is your financial stress the result of negative expectations based on a fear that God won’t provide? Have you made an inner vow that you will never be financially dependent and so you hold money with a tight fist? Generosity toward you may be eluding you, because you are fearful of being generous with others. Money is neither moral nor immoral. Money is just a way to store, exchange and use the time + energy you and others have expended. The condition of your heart will determine if it is a tool for remarkable generosity or malignant greed. I have also seen the scarcity of money prompt both desperate and noble acts depending on the heart condition of its possessor. While money is not moral; neither is meagerness next to godliness. “Healthy” does not mean “just enough.” This idea is why so many people see their destinies relegated to wishful thinking. Have you ever said, “I have such a heart for…” but feel you are a hostage to your own crummy finances? Jesus, like everyone else, had to handle finances. He serves as the model for us in this area of life as well as all others. So how did he handle money? Jesus started life with a princely endowment thanks to the wise men, and learned to work for a living as a tradesman. He frequently taught about money and possessions but during his ministry phase chose not to own a home. His spiritual parables were loaded with financial metaphors. He upended a rich young ruler and then proclaimed the Kingdom had come to a successful tax collector. He surgically divided Caesar’s and God’s currencies. He had a crooked treasurer and sent Peter fishing for tax money. He praised an impoverished widow’s offering and a female friend’s lavish anointing. His relationship with money had many points of contact, but it was healthy. Jesus’ key financial advice is very relevant now: “Don’t be anxious.” (Matthew 6) Jesus assures us that we have a generous and creative Father taking a personal interest in our welfare, so we don’t have to wait for the world economy to turn around before He figures out what we have need of. Let’s face it, if you eat a couple of times a day, have shoes and clothing to wear, hot running water, or even drinkable water, and you can read this, you’re rich compared with most of the people on the planet. So it’s not about the economy, it’s about your economy, your personal relationship with money. Your Heavenly Father doesn’t need to resolve the worldwide mortgage crisis to shelter you. It doesn’t take a turnaround in quarterly retail sales numbers to clothe you. He doesn’t need to bail out the global banking system to see that your bills get covered. He isn’t waiting for a bounce in consumer confidence to give you a hope and a future. And that will be a lot easier if we stay grounded in the Father’s love and let Jesus restore our souls, including the parts that are financially sensitive. Only then will we not allow economic turmoil and financial stress to drown out the voice of the Spirit. Financial blogger, Connie Brooks, at http://www.askmrcreditcard.com gave this insightful, and generous, review of HYFS. So I'm reprinting it here - with some bold-face added by me for emphasis. To me, this book is an excellent example of Teddy Roosevelt’s famous quote “Speak softy and carry a big stick.” The “big stick” in this book is the wealth of facts, and David’s excellent understanding of financial psychology. The “speak softly” part comes into play with the generous humor sprinkled throughout the book, and the realization that everyone has money problems, even the very wealthy. See, that’s the kind of book this is - the sort that gets you thinking, deep down, about what’s really going on with your money. Now, I’m not suggesting y’all are greedy (I’m from Kentucky, I’m allowed to say y’all with impunity!) Just that greed is apparently one of the challenges I am facing. The beauty of this book, is that it helps you come up with your own answers - the ones that fit you specifically. I love these examples because I believe they are true as well. Many of us watch our grandparents, parents, or friends struggle financially. Somehow, somewhere, we picked up the message that we should struggle too. That you have to struggle for money - you have to fight claw, scrape, scrimp and save just to make ends meet. He sums up the money / capacity issue by explaining that it’s like taking a cup out into the ocean to collect water. Now matter how deep you swim, or how many times the waves break over your cup, you can only carry one cup of water out of the ocean. There are oceans of wealth out there too - money is plentiful. Our capacity to gather it is what we have voluntarily restricted. If I could stress any one thing about Healing your financial soul, it’s that it is a fun book. It’s a happy book to sit down and read. It gives you pause for thought more often that it gives you direct instructions, and with each realization you gain that much more control of your own money - your own life. Many Canadians are staying alive on a form of financial life support - their credit cards. So says a recent study by the Vaier Institiute of the Family, which revealed that an increasing number of Canadian families pay hefty prices for their credit-card dependency. "If you look back to 1990, on average households would end up with about $7,000 in annual savings," says Vanier Institute executive director Clarence Lochhead. "That's down to about $1,000 today." According to Statistics Canada, Canadian families are spending approximately 127 per cent of what they earn each year. The average household debt is $80,000. Cathie Stoliker of Ontario's Waterloo Region can testify to the heavy price tag of debt. As a single mother of three small children, she battled credit card bills and a large mortgage. "There would be times of extreme work followed by long periods without," she says. "Credit cards were often used to pay expenses." Every month new credit cards arrived in her mailbox. "Retailers tempt consumers to buy with no money down, no interest and no payments until a future date," she says. "We live in an instant society. We want everything now. [But] we cannot always predict our financial future." To conquer her speding habits, Stoliker says she made a decision "not to tolerate debt any longer. I disciplined myself to live within my means. I quit spending other than essentials. I set goals to pay off credit cards. I went to the library and read a book about paying down our mortgage... Eight years later, the mortgage was paid." In February Stoliker spoke at "Debt-Free Women," an inaugural event hosted by Women Alive and FaithLife Financial which launched a series of educational forums to help consumers conquer debt. "We live in a materialistic society that encourages us to live beyond our means," says Janet Johnson of FaithLife Financial, a financial services member organization. "We are surrounded with advertising promoting consumerism and encouraging more credit cards, lines of credit and larger mortgages.There's confusion between our needs and our wants; our society is full of status symbols that have nothing to do with our needs." 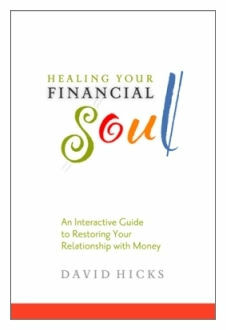 David Hicks of Stratford, Ontario is the author of Healing Your Financial Soul. An independent financial consultant, he believes the root of debt lies in a person's unhappy spirit. "Money is never a problem," he says. "It's just that people's real problems show up in their finances. Money acts as a kind of catalyst or accelerant. It simply magnifies whatever is in a person's heart. And time leverages it as debt." Canadians aren't in debt for a lack of information, says Hicks. "It is an absence of understanding... I think the debt situation has more to do with using debt to temporarily medicate stress." With regards to "fixing" debt, Hicks isn't quick to jump on a financial plan. "A plan helps, but without an internal shift, it won't hold," he insists. "First, deal with your baggage." Hicks' advice stems from personal experience. Despite a successful business consulting badkground and years of ministry, Hicks eventually experienced financial disaster. After turning within to deal with his own emotional baggage, Hicks wrote Healing Your Financial Soul. "You don't need more lectures, guilt and regret adding to your frustrations and disappointments," Hicks says. "It's just that your finances are demonstrating what you actually believe, deep down, about money and your relationship with it." Johnson agrees. She believes people are tired of being slaves to money. "They are beginning to wake up to the notion that this can't be what God intended for them." 2008 article for "New Horizons"
It empties our bank accounts and fills our stomachs. It doesn’t grow on trees, yet it’s green and ‘leaves’ when school begins. Cold hard cash… While knowledge is priceless, university costs. So remember to spend time investing in the financial side of things as well. Trust me; you’ll be thankful you did when your only remaining debt is the love you feel for your Profs and peers. David Hicks is the author of Healing Your Financial Soul. He urges students to count the cost ahead of time. “If I was to go back and do it again now, I’d hire a life coach for a few hundred bucks and spend a couple of months clarifying my purposes and goals first,” Hicks tells New Horizons. When you’re first stepping out and unsure of how many holes are in your pocket, it’s wise to keep a firm grip on your wallet. Firstly, identify how you’re spending your money; then, evaluate your current spending and set goals which take into account your long-term financial objectives. Finally, track your spending to make sure it stays within those guidelines. If you visit http://tools.canlearn.ca, the Financial Planner will assist you with an online budget planner. “Besides having a creative and playful outlook on how to have a good time on the cheap, please budget both time and money for fun,” urges Hicks. With tuition rates constantly on the rise, a student loan is a wise notion. The Canada Student Loans Program (CSLP) (www.hrsdc.gc.ca) provides loans and grants to Canadian students provided they show proof of financial need. Canlearn.ca offers The Student Loan Estimator, an interactive web application that can be used by full-time students to estimate their total student loan. It was designed to show the amount of assistance you could potentially receive from both the CSLP and provincial funding authorities. You will then have the option to use the Loan Repayment Calculator, which estimates the monthly payments you may need to make in order to repay your loan. Of course, nothing is sweeter on the student’s palette than free money. So if you can cash in on your smarts or skills, go for it! Check out www.studentsawards.com for countless opportunities. Simply sign up, and the website will match you with thousands of bursaries, scholarships and cash awards. Besides getting a part-time job, Hicks suggests going one step further. Not only does buying a house guarantee rent-free living; you’ll finish with either equity in your home or at the very least, a home base from which to begin your career. Throughout the Bible there are roughly 2,350 verses about money. God knows money is an integral part of life—and if allowed to, it has the power to destroy a person’s soul. “The love of money is the root of all evil,” cautions 1 Timothy 6:10. Hicks warns young adults to face their impulses, temptations and fears surrounding money. “What may surprise, shock or simply disappoint … is not only the mathematical costs of housing, food and day-to-day expenses, but the emotional and spiritual impact of money,” he says. This unusual book on money is written by an author from Sebringville. The book "is NOT about budgeting, saving, investing or fundraising - it's an interactive, participatory experience to help Christians deal with their 'baggage' about money." Mr. Hicks has some unconventional activities for the reader to try. One will have to confront their money mindsets, look at family habits, and consider biblical passages on the topic. While there is an abundance mentality within the book, it definitely is a read that will make you think. It will make you begin that personal and internal conversation about money you have been avoiding. That may be reason enough to take a look. Seth Godin is a marketing luminary who is passionate about people tackling their purpose and not their wasting time. I decided, as part of my re-branding process for the HYFS seminar, to answer his rhetorical questions. Stymied Christians whose ideas, dreams, callings and destinies are held hostage by financial stress and constraints. The men and women who are pastoring these families and individuals. Why? Because I love the Church and its people and families; because I want to see marriages healed, childhoods redeemed and poverty broken; because the Church shouldn’t be so mediocre. Financial breakthrough from the inside – the fruit will speak for itself. To break old, self-sabotaging, self-defeating patterns of thinking, believing and behaving regarding money. Teaching, prayer, ministry, practical exercises and experiences that break up those old patterns and make room for God-breathed truth and freedom. To renew the financial mindsets of Christians to stop living out of need and live lives of depth and generosity. Why? Because I sure needed it. And because I’m frustrated by the mediocrity I see in the Church, the financial lack that holds back generosity in the face of great need. A decent income for Charmaine and me – and millions for the poor, hungry, naked, sick, lame and imprisoned. Why? I believe in a good income for fair value, to provide for Charmaine and live well within the Canadian context. And the millions because I want to stand before Jesus and know that I fed, watered, clothed and visited him because I love him and he loves people. I am willing to commit 1 or 2 weekends per month to start. I am willing to dedicate half of my workweek to this. Why? This is more meaningful to me than my other work. The financial landscape of the Church. Poverty mindsets and ‘Benign Scarcity’. Financial stress and family tension. Career mediocrity and business blandness. Why? Because it might have helped me when I was in full-time ministry; because I’m tired of how ministry is paired with marginal finances; I’m frustrated by Christians’ meager expectations; I’m saddened by the toll that want takes on marriages and families. David’s material helped heal our marriage. HYFS brought healing to wounds from my childhood. HYFS removed blocks to my career, business, ministry, investing, money management and giving. David’s book revolutionized my relationship with my Heavenly Father. David’s seminar was fun and changed how I look at and live my life. Why? I want to know I had a hand in changing people’s lives, relationships and experiences of God. Parents, single parents, business owners, wage earners, executives, pastoral couples, elders, missionaries, students. I am a credible source. Why? I’m an articulate communicator. I’m a former Director of the TACF School of Ministry. I am an ordained minister and prayer minister. I am a prophetic teacher.